This is just the PCB, tested and guaranteed to be working. It works everywhere in the world, from 110V to 240V (50/60Hz). It pushes about 2A at 15V DC stabilised. AC Input: 100/120/220/240 VAC + or - 10%. (47 to 63Hz). Output Ripple: 10mV, +0.05% Of Output Voltage Max. Stability: 0.05% For 24 Hours After Warm-up. Temperature Rating: 0deg. 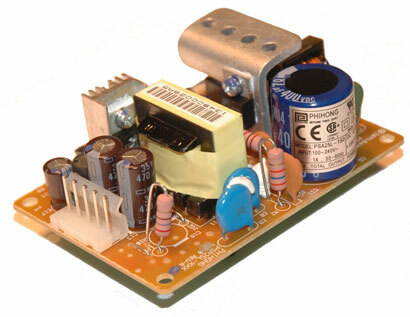 C Full Rated, Derate Linearly To 40% At 70~ C.
Please that these power supplies are just the PCB without an enclosure. 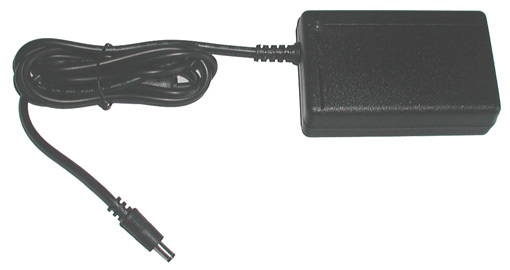 They also require power cord for your country (they are hard to obtain here and typically cost just a few dollars or you can take one from a PC). There is high voltage present on the PCB and you should be very carefull when handling this unit! Your transmission system is only as strong as its weakest link. Using cheap or inferior cable can severely limit your broadcast power and range. The best way to determine if a cable is right for your application is to make sure that it has a low dB loss at your frequency. Belden is an internationally recognized brand and stands for good quality cables. Cables are available with professional connectors installed, please specify type at ordering! There are two types available, smaller diameter H-155 and semi-rigid thicker H-500. For short runs (~ 5 meters) it doesn't make sense to invest into expensive cable, but as your cable length approaches 10-20m or even more, it becomes a real problem and it is worth spending a little extra. If you wish to order greater length of cable than displayed below, simply order 2 or three of a given lenght. For example, if you order 2x20m of Belden H-155, we won't cut the cable but rather send you a full length of 40m. Any FM transmitter should be tested before even trying to use it with an antenna. 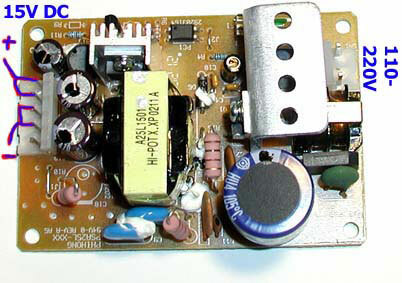 Any tuning or testing of a FM transmitter requires use of a dummy load. This prevents unwanted radiation during test and tune procedure and makes sure your transmitter output stage is always correctly loaded. We are offering you two dummy loads. 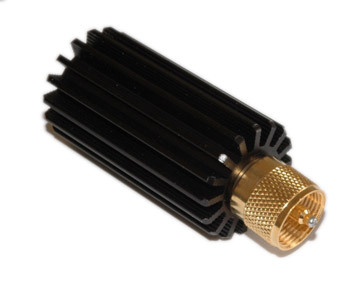 60W version is suitable for smaller transmitters and we recommend this version for most customers. 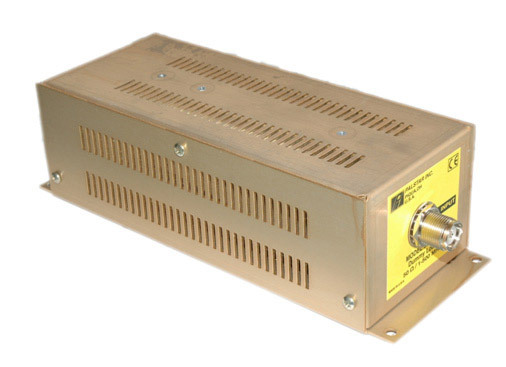 1500W version can be used practically with any transmitter available at our website and is recommended for anyone experimenting with power amplifiers. Highly recommended and a must have for any serious broadcaster. All FM transmitters produce harmonics at even multiplies of your fundamental frequency. If your harmonics fall on or near TV channel or Maritime frequency you could cause severe interference on that channel. The most common cause of fines from federal agencies is due to TVI or other interference from your transmitter which generates a compliant. Use of a low pass filter is the best method of eliminating this kind of interference. Since the insertion loss of these filters is less than .01dB, these filters are well suited for use on power levels as low as 100 milliwatts on up to 300 watts. For more power please ask, we have more powerfull models as well. This is a fully housed unit, tested and guaranteed to be working. The center of the power plug is positive so be carefull not to reverse polarity. It works everywhere in the world, from 110V to 240V (50/60Hz). Output Ripple: 10mV, +0.1% Of Output Voltage Max. Stability: 0.1% For 24 Hours After Warm-up. Note that these power supply modules also require power cord for your country (they are hard to obtain here and typically cost just a few dollars, radio shack and similar stores carry them). Finally you can virtually "print" your printed circuit board! Now you can produce your own printed circuit boards from any printed artwork in minutes! Since introducing Press-N-Pee!, Techniks has received an abundance of inquiries and orders with numerous customers extending compliments for the time and effort saved in producing quality printed circuit boards. A unique feature of Press-N-Peel is its multi-layer coating that transfers an additional layer of resist on top of that provided by the toner. This ensures that traces do not drop out and solid areas are not riddled with pit holes. Trace widths of 5 mills ITEM PRICE WGT and less are possible! Sold by the sheet at $3 each. A must have item for proper tuning and peaking of transmitters and RF amplifiers. SX-200 covers the entire spectrum from 1.6 to 200MHz with 5% accuracy. The large meter scale is calibrated for forward and reverse power and standing wave ratio (SWR). Switch selectable average (RMS) and Peak Envelope Power (PEP). The meter has three power ranges that are switch selectable as indicated under "Full Scale Power" below. The model SX200 can accurately read power levels as low as 50 milliwatts! Inputs and outputs are 50 ohm impedance using SO239 connectors. Image is symbolic, shipped unit might differ slightly.